Grizzlies, black bears, moose, a lynx, various species of owls, frogs, snakes, etc – it has been an amazing year. I have likely seen more species of wildlife in this past year alone then I have in my entire life combined. I wanted to pay tribute to my adventures in wildlife photography and viewing by dedicating a blog post to particular species, settings or surroundings for each month of 2013. 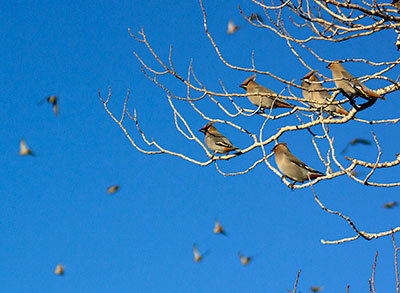 The feeding frenzy of the Bohemian Waxwing is a sight to behold. 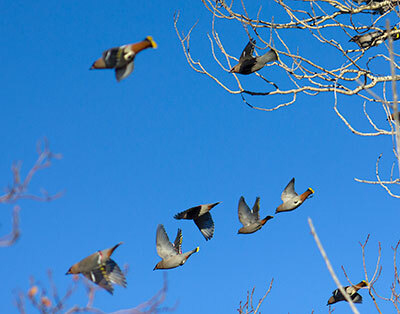 It is not uncommon in the winter in Calgary to see several hundred (or even thousands) of these colourful birds, perched high in trees, taking turns to swoop down and feed on berries. Their favourite are Mountain Ash, but I’ve seen them flock on other types of berries as well. I was walking to work one morning on a cold winter day, probably -30 Celsius with the wind chill, and heard the high pitch whistling that I now know as the Bohemian song. I peered up from my hood and was treated to a flurry of activity in the trees above. There is a row of trees that produce a large volume of berries (not sure what kind) adjacent to the pond at Mount Royal University, and the Bohemians were having a feast! Luckily, we have an office camera, so I ran to my office, grabbed the gear and endured the frigid cold to get several shots of the magnificent sight. The images were not great, but the experience was enough to get me hooked on watching and photographing birds. My images were even featured in Mount Royal’s internal newsletter. I have seen and photographed several large flocks of Bohemians since. I know the song; I’ll often hear it when I’m out walking in Weaselhead or one of Calgary’s other parks, and follow it until I find the frenzy. The song lured me to venture up the side of a treacherous, snow-covered slope in Edworthy park last March, rewarding me with some of my best ever Bohemian shots. 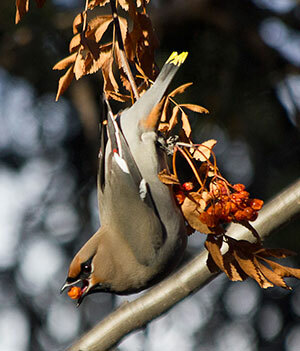 I love watching them snag the berries, throw their heads back and swallow while hanging from delicate branches. I have yet to see the frenzy this year, but it’s still early winter – I know I will hear their song soon! 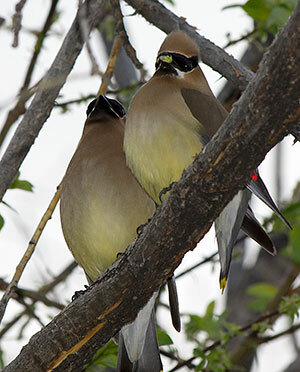 Birding Note: the Cedar Waxwing is the summer counterpart to the Bohemians. They look very similar, but the Cedars have a light yellow under-belly and the Bohemians have rusty red. Cedars are also very common in Calgary, and while they are seen in flocks, they do not tend to be in the hundreds or thousands like the Bohemians. Other than the colour of the under-belly, the best clue for identifying the species is the time of year. Bohemians are here in the winter and Cedars in the summer. Check out more bird photography in my Small Land Birds Gallery and watch for Part Two: February 2013: Snowy Owls and Snow Buntings. Thanks for sharing, Kerri. Looking forward to your next post. Great, Kerri, thanks. I love the flocks of Bohemians we get even along the streets here: raucous feeding frenzies! And I’m looking forward to seeing the photos of snow buntings. I’ve never seen one in the wild.